Gov. 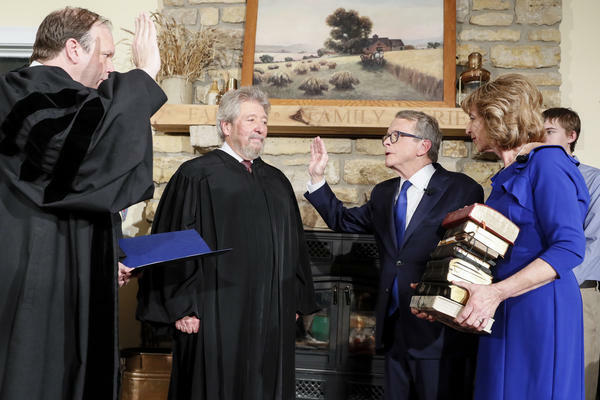 Mike DeWine takes the oath of office administered by his son, Ohio Supreme Court Justice Pat DeWine. Gov. 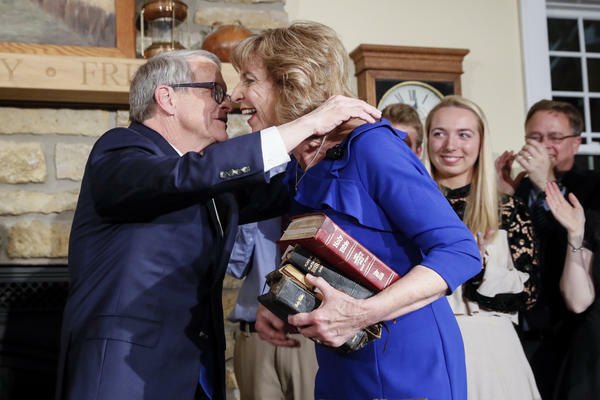 Mike DeWine hugs First Lady Fran DeWine after being sworn in as governor. Gov. Mike DeWine signs oath of office document along with several executive orders. 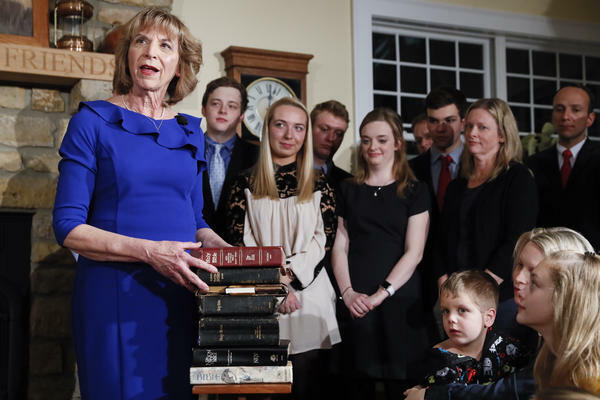 Fran DeWine talks about their various family Bibles and the significance of each one. Surrounded by family and friends on his farm in Cedarville, Mike DeWine took the oath of office to become the 64th person to serve as Ohio Governor. 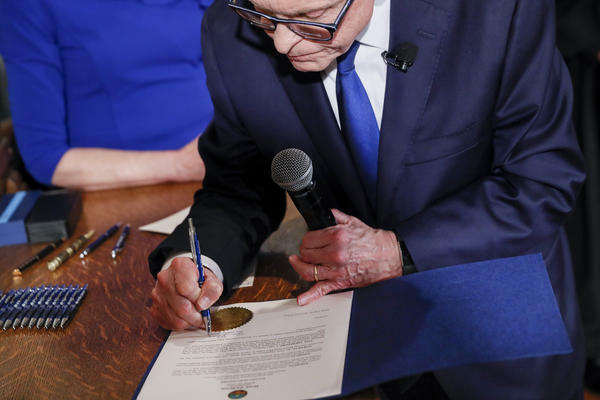 DeWine signed six executive orders immediately after taking office, including an anti-discrimination policy for state government employment that added pregnant women, parents of young children, and foster parents as protected classes. That policy also includes gender identity as a protected class, something former Gov. John Kasich just recently added. Other executive orders created the Office of Children’s Initiatives and RecoveryOhio, an initiative to fight the opioid epidemic. The longtime Republican politician began his career in public service in 1977 as the Greene County prosecutor. From there DeWine continued to climb going from the state Senate to the U.S. House of Representatives to Ohio’s Lieutenant Governor. Starting in 1995, DeWine served as one of Ohio’s U.S. Senators for 12 years. When he lost his race to current Democratic U.S. Senator Sherrod Brown, DeWine returned to statewide politics to run for Ohio Attorney General. He won that office in 2010. DeWine was elected governor in November by defeating Democrat Richard Cordray. As Gov.-elect DeWine has assembled a diverse cabinet with many years of accumulated experience. He says among his top priorities will be children’s initiatives, the opioid crisis, and workforce development. Inauguration Day is here. Mike DeWine will be sworn in Monday as Ohio's 70th governor. Watch the ceremonies live, courtesy of the Ohio Channel. LGBTQ advocates are cautiously optimistic about the future of an executive order signed by Gov. John Kasich that bars discrimination against transgender state employees.